Try these great recipes for homemade dog treats, and if your dog likes them, bring some for us to sell at the Farmers Market! Preheat oven to 350 degrees. Combine all ingredients and stir thoroughly. Drop by spoonfuls onto an ungreased baking sheet. Press flat with a fork. Bake for 15 minutes. Cool on a wire rack and store in an airtight container. Makes about 20 cookies. Preheat oven to 400 degrees. In a mixing bowl, combine flour and baking powder, then set aside. Blend peanut butter and milk together. Add to dry ingredients. Mix well. Roll dough out and cut like Christmas cookies (1/4 thick at least). Bake on cookie sheet for 15 minutes or until lightly browned. Refrigerate or freeze. Preheat oven to 200 degrees. Place four and garlic salt in a large bowl. Stir in bacon fat. Add cheese and egg. Gradually add enough milk to form a dough. Knead dough and roll out to about 1/4" thick. 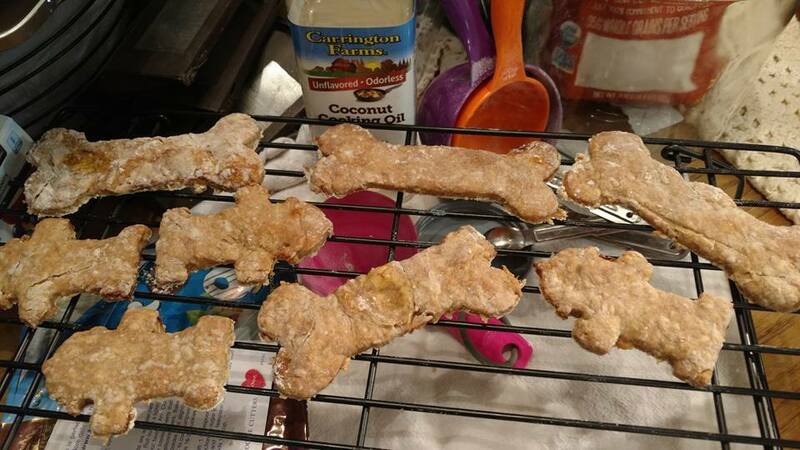 Use dog bone cookie cutter to cut out dough. Place on greased cookie sheet. Bake about 12 minutes, until they start to brown. Cool and serve. Preheat oven to 375 degrees. Put salmon in food processor and process until it looks like something the cat threw up. Add eggs and garlic powder and process again. Add rice flour 1/2 c. at a time, processing well after each addition. It will look more moist than cookie dough. Put in a greased 11"x7" baking dish and bake for about 15 minutes. Preheat oven to 300 degrees. Dissolve bouillon cubes in hot water and then mix all ingredients together. Bake on greased cookie sheet for 1 hour. Turn oven off but don't open door. Leave in oven overnight to crisp up. Preheat oven to 325 degrees. Grease 2 cookie sheets. Dump everything into a VERY large bowl. Mix this whole mess together (use your hands, if needed), pat onto greased cookie sheets & bake for 1 hour. After 1 hour, turn oven off, crack oven door and allow cookies to cool in oven. Break into whatever size you want. These freeze really well.